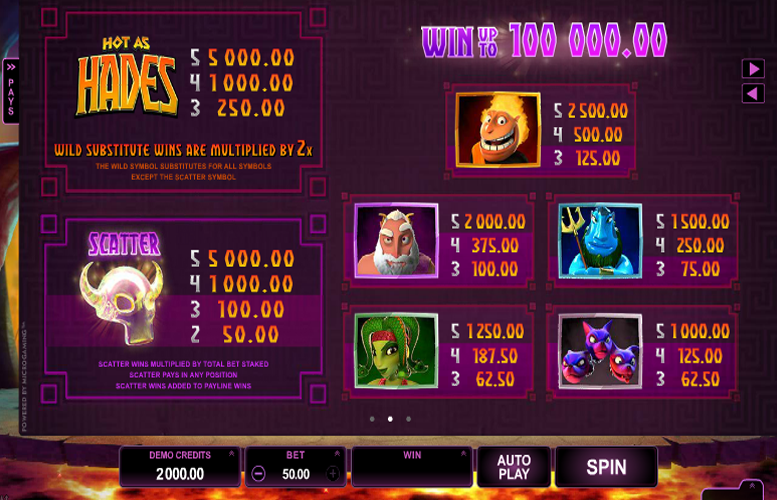 The Hot As Hades online slot machine from Microgaming takes us on a tour of the underworld with its most prestigious inhabitant as our guide. During the game, we must help Hades quest against his siblings to uncover great riches in some exciting game modes. Despite the subject matter, it’s not all fire and brimstone. In fact, the title doesn’t take itself too seriously at all. There are amusing animative touches throughout the game and the art style itself is fun and irreverent. Nice animative touches throughout. Players will often see Hades himself sailing across his lake of fire or just coming checking in on the action reel side. Interesting second screen bonuses. The Quest Bonus is particularly entertaining. Strange choice of art style for a slot machine that is all about hell and the devil of Greek mythology. It’s a lot more cartoony and has a much lighter feel than you might expect. Low upper betting limit. Some machines allow players to bet up four-figures on every spin. This makes the £50 offered on Hot as Hades seem miniscule in comparison. Game Logo “Wild” = 100x the total bet. Skull Helmet “Scatter” = 100x the total bet. Hades = 50x the total bet. Zeus = 40x the total bet. Poseidon = 30x the total bet. Medusa = 25x the total bet. Cerberus = 20x the total bet. The biggest possible payout on this slot is 100,000 coins. Landing three or more Skull Helmet “Scatter” symbols anywhere on the reels will trigger the Quest for the Crystal Helm bonus. Players must quest to reclaim the crystal helm. It’s guarded by the various gods in the game. During this game feature, players travel from the underworld and must attempt to outwit their adversaries for bonus rewards. Finding Cerberus will award all prizes for the current level. There are also some hidden pitfalls that will instantly end the quest. If players are fortunate enough to complete all four levels, they will reach Zeus’s Chamber. There they will play for the Crystal Helm itself. This offers increased prizes. The Hot as Hades Super Mode is triggered randomly during the main game. Players will receive five free spins. 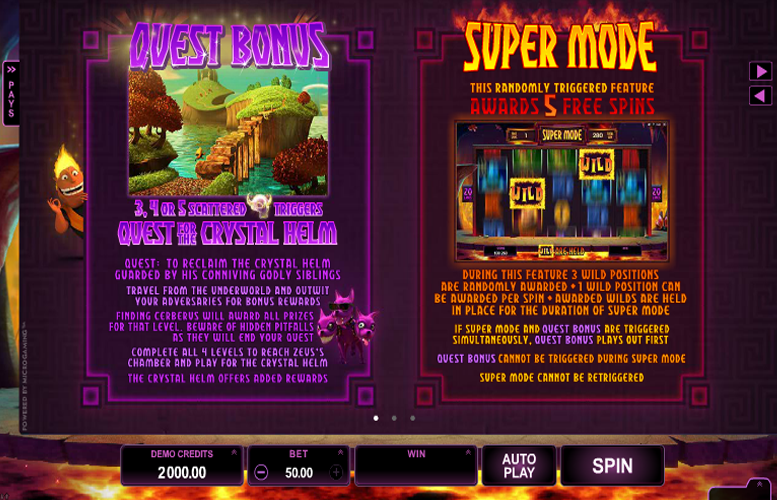 During the feature, three “Wild” symbols are randomly awarded with the opportunity to receive an additional “Wild” position on every spin. Every “Wild” symbol added will remain in place for the duration of the Super Mode. Players should note that if both the Super Mode and the Quest Bonus are triggered at the same time, the Quest Bonus will always play out first. The Quest Bonus also cannot be triggered during the Super Mode and the Super Mode cannot be retriggered. Ace = 10x the total bet. King = 7.5x the total bet. Queen = 5x the total bet. Jack = 2.5x the total bet. Ten = 2.5x the total bet. Players are rather limited when it comes to varying their betting habits on Hot as Hades. Unlike most slots, there are not options to adjust the number of win lines or how much is bet on each one. There is only a “total bet” option. Fortunately, there are loads of different total bet amounts. These range from just 20p, right up to £50 and every 20p increment between these two figures can be wagered. Although the amounts might not be as high as on some slot machines and there aren’t the same options to spread bet amounts around, the sheer number of different intervals between the maximum and minimum bet is certainly a nice touch. That said, Hot as Hades is never going to impress the highest rollers around! 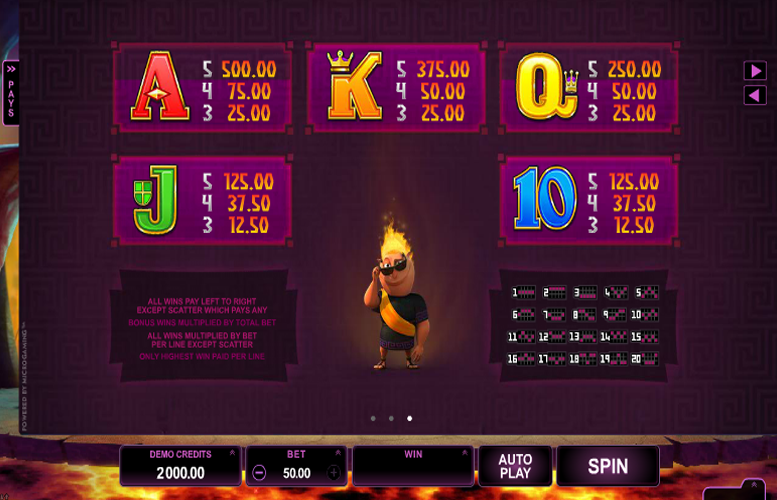 All told, the Hot as Hades slot machine from Microgaming is a fun little title with some nice special features. The artwork might be a little juvenile for the theme and the highest bet amount will be smaller than some are used to, but the interesting and topically relevant special features make this a worthy game to have a punt on. 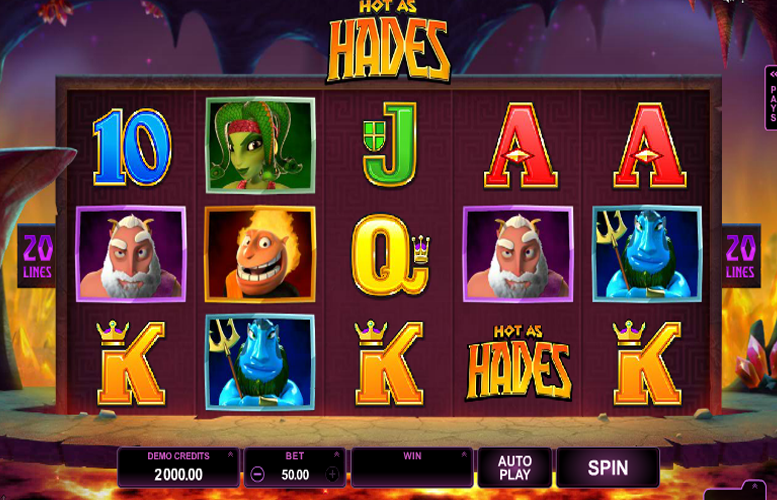 It’s by no means the finest title we’ve ever played but we’re sure many will get great enjoyment from the Hot as Hades slot machine. This game has a rating of 3 / 5 with 475 total reviews by the users.